Due to security changes in modern web browsers, it is no longer possible to display a custom message to a site visitor. Scammers were abusing the same technology used by the Exit Prevention trigger to display confusing messages. The result was that visitors were tricked to install malware and other unwanted programs on their computer or mobile device. 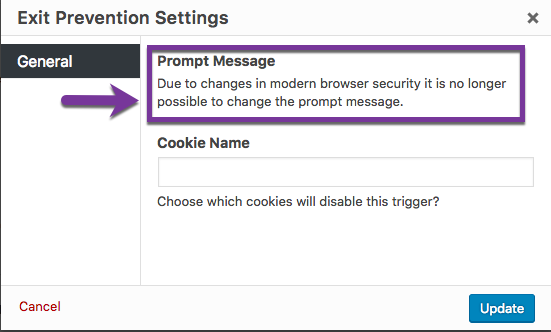 By removing the custom messaging feature, modern browsers are now more secure. Unfortunately, the Exit Prevention trigger is no longer usable. The trigger should be ignored. What is a Popup Trigger?